We are all composed of chemistry that controls everything we do. Trillions of chemical reactions are simultaneously taking place in our bodies every single second of our lives. 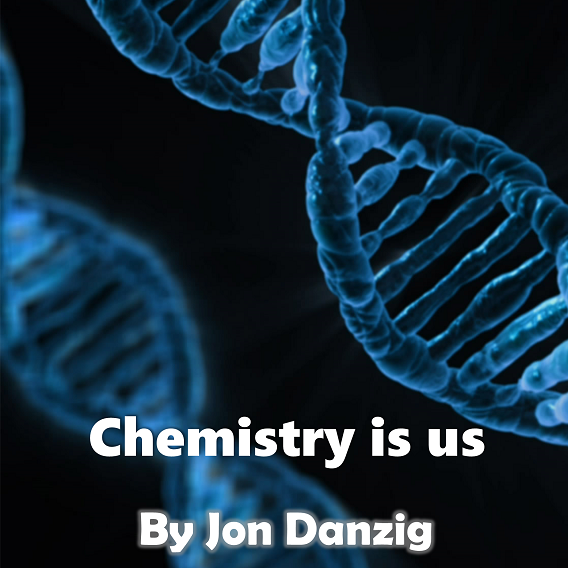 The very instructions for how we’re built – DNA or ‘deoxyribonucleic acid’ – is chemistry at work, uniquely codified in each of us to formulate the individuals that we are. The DNA contains instructions that drive the metabolic chemical processes in our bodies which keep us alive. We breathe, move, sense, grow, repair, reproduce and digest because of a concoction of chemicals automatically at work during day and night, awake or asleep. Our thoughts and ideas are also chemistry at work. Our brain is composed of about 100 million nerve cells called neurons, interconnected by trillions of connections called synapses. Just one thought, occurring within a few hundred milliseconds, involves a chemical signal from the synapses spreading to billions of neurons in several dozen interconnected areas of your brain. And not just thoughts – but feelings and emotions too. They may seem profound, and yet, all feelings and emotions are also at their base a series of chemical reactions. Everything we do, everything we feel, every function of our bodies, every thought, every memory, all our actions and responses, are down to chemistry: clever chemical multiple messengers that react and interact and drive who we are, how we are, and what we are. Even before modern medicine deciphered the chemical code of human existence, philosophers argued whether we truly have ‘free will’. We now know that chemicals control our functions, but can we as sentient, intelligent beings control those chemicals? Jean-Paul Sartre, arguably the greatest philosopher of the last century, had no doubt. We’re in charge. The concept of ‘freedom’ was central to Sartre’s thinking and dominated his political and philosophical works. There is no God, considered Sartre. People are ‘free beings’ and are therefore completely on their own, and totally responsible for everything about themselves, including all their conscious thoughts and actions. Even when freedom is limited, wrote Sartre, there is still freedom of choice. For example, a prisoner is free because he or she can control whether to attempt to escape. According to Sartre, any human who tries to dismiss their actions because ‘that’s just the way I am’ is deceiving themselves. Being a human, in the opinion of Sartre, brought both freedom and responsibility, and therefore free choice in the decisions one makes as a human. "Man can will nothing unless he has first understood that he must count no one but himself; that he is alone, abandoned on earth in the midst of his infinite responsibilities, without help, with no other aim than the one he sets himself, with no other destiny than the one he forges for himself on this earth." On the other hand, Albert Einstein, another giant of the last century and arguably the greatest scientist of all time, had an opposite view. He was a determinist - the doctrine that all events, including human action, are determined by causes that we cannot control. In other words, we don’t have free will. Einstein summarised this in his famous quote, ‘God doesn't play dice’, meaning that all actions have a pre-determined reaction as a result of laws fixed by our ‘creator’. In Einstein’s view, everything that happens in our universe, from the actions of atoms or planets or gravity, or indeed humans, is predictable. Not entirely predictable to us, as we simply don’t have the knowledge. But if possessed with all knowledge, all actions and reactions can be known and foreseen. "Everything is determined, the beginning as well as the end, by forces over which we have no control. It is determined for the insect as well as the star. Human beings, vegetables, or cosmic dust, we all dance to a mysterious tune, intoned in the distance by an invisible piper." Me: So, is God all powerful? Me: Does God know everything? Me: Does He know your next move, even though you don’t? Me: So, how can there be free will? If we don’t have free will, however, are humans nothing more than robots, albeit having and giving the impression of ‘free will’, but not in reality possessing any? What do you think? Or should I ask, what does your chemistry think?